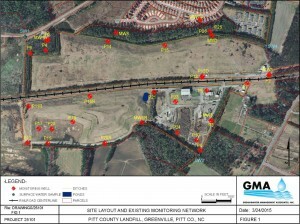 GMA has provided Pitt County (NC) with turnkey hydrogeological assessment and regulatory compliance monitoring of groundwater quality and migration patterns beneath a municipal solid waste landfill for more than 20 years. In 1993, GMA performed a comprehensive, pre-closure, hydrogeologic characterization of the 140-acre, two-cell, unlined landfill by evaluating at-risk groundwater and surface water receptors, and installing and testing 25 monitoring wells and piezometers. We developed a Water Quality Monitoring Plan in 1994 to comply with RCRA Subtitle D landfill rules. We also planned and implemented a detailed field characterization of solids, liquids, and fugitive gases at one problematic waste unit containing hazardous debris from a chemical facility fire. Since 1994, GMA has provided semiannual, groundwater and surface water sampling, laboratory and statistical analyses, and reporting for the landfill. Statistical analyses of interwell and intrawell prediction limits for barium detections in groundwater were performed, and Sen’s Slope/Mann Kendall trend tests were used to evaluate trend significance and demonstrate a naturally-occurring source for barium detections. In 2001, GMA helped Pitt County address financial assurance requirements by producing scope and cost analyses for long-term, post-closure maintenance and monitoring of the landfill. In 2005, GMA prepared and implemented a Methane Monitoring Plan for the northern landfill cell to address concerns related to encroaching residential and commercial development. Since 2013, we have provided Greenhouse Gas Emissions analysis and reporting for the landfill to comply with Federal EPA regulations.